Adapted from the UMD Commencement web site. Civil engineering major and Engineers Without Borders volunteer Heungkook "HK" Stephens will serve as student speaker at the UMD main commencement ceremony on the afternoon of May 20. Stephens helped Engineers Without Borders provide a sustainable water source in Brazil and a water chlorination system in Peru. He directs a youth ministry and, before coming to Maryland, spent a month in Bangladesh teaching character education. "It was in Bangladesh where I experienced the great amount of good an engineer could provide for a developing community," he says. "During that year I also began to understand how helping others took more than technical expertise." Stephens has that expertise, and he has heart, says Alan P. Santos, director of student services in the civil and environmental engineering department and Stephens' academic adviser. "HK is committed to doing something with his degree other than doing well financially," he says. "His passion is doing something good." He's also an avid dance fan. He discovered his skills during a middle-school quest to look cool, and that led to his earning a spot on the university's Dynamic Dance Team and then in the competitive Culture Shock D.C. troupe. Stephens also was attracted by the group's mentoring program. He juggled that with his courseload, an internship with the Silver Spring engineering firm Charles P. Johnson & Associates and undergraduate water treatment research. 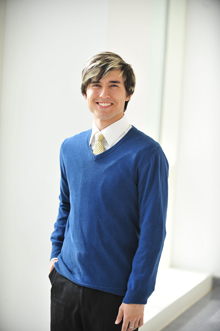 Stephens, 22, also is a youth group program coordinator with his wife, Jin Soon. He loves his full life, but looks forward to a change of pace after graduation. The fourth Terp in a family of five, Stephen will stick with Maryland for graduate school. He plans to study the advanced detection and deactivation of waterborne pathogens. The main university commencement ceremony will take place at 1 p.m. in the Comcast Center. The Clark School commencement ceremony will be on May 21 at 4 p.m. at the Comcast Center. Read more about the Clark School ceremony here.